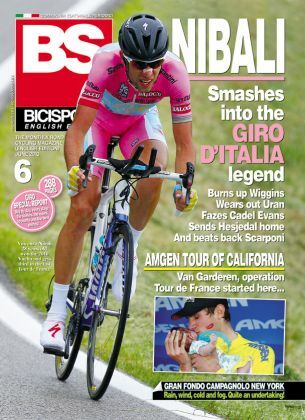 The Italian BICISPORT June edition focuses on the 2013 Giro d'Italia with stories and riders' accounts and the best photos from the race won by Nibali. Also Amgen Tour of California: Tejay Van Garderen shines ahead of the Tour de France; GF New York: a challenge in stormy weather; plus more in 288 pages. The magazine is available in English in a digital version for iPad or Android. You can subscribe or buy a single issue; this issue is available here.